From the Partner Online Community microsoft.private.directaccess.actionpack which is available for all Microsoft Partners we have learned that Essential Business Server 2008 will indeed be a part of the Microsoft Action Pack Subscription. The tentative delivery date for EBS 2008 in MAPS will be with the October shipment. For those of us servicing the SMB/SME market area where EBS is situated to sell this is important news. If we rely on our MAPS for our product install base in our own office, then this heads up gives the opportunity to do some infrastructure planning. If we do not necessarily rely on MAPS, this gives us a good time frame for the EBS release and plan our infrastructure moves accordingly. Either way, EBS will be a minimum 3 server install with the Premium Edition having a fourth server for a dedicated SQL 2008 install. 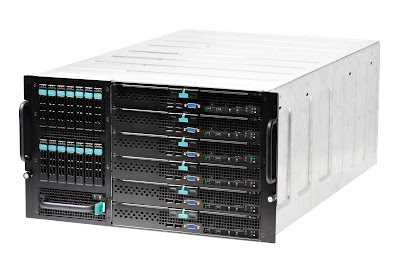 The EBS Standard 3 server setup makes the Intel Modular Server a very attractive option for those clients that are in a position to refresh their server infrastructure as the break-even point between a standard set of 1U/2U servers and the Modular Server is three servers. For EBS Premium with the fourth server required, the Intel Modular Server is an excellent infrastructure foundation. Add a Terminal Services Desktop or Remote Applications publishing need and thus an additional server over and above the EBS Premium requirements and our clients will see a very quick return on their investment. A point to ponder: Intel Associate and Premier Members receive a very steep discount on their first Intel Modular Server purchase from the Demo Advantage Program under the Sales Tools Store. Check it out.